... at least that's what I was doing before I decided to finish this Portrait of 'Alfie' instead! I had planned to spend a few hours on the latest bear, only to find that the last layer was still too wet to work on. So, every time I tried to work on one area, I smudged another! It just wasn't worth the risk. Anyway, a couple of weeks ago I was asked to do a pencil portrait of this adorable little chap, 'Alfie'. I did the hat a few days ago when I had some time to spare, and I did the rest this afternoon. My hat goes off to Crystal Cook, who seems to effortlessly produce endless, perfect baby portraits, but portraits are completely out of my comfort zone and this is my first attempt at drawing a baby. They are so perfect, in fact their adorable, squidgy, pudgy faces are actually too perfect; Their skin is flawless and smooth, their skin tone is even, but this means that there is little skin texture and tone to work with. I started with a sketch on a separate piece of paper, just to get the shape of the face and the features correctly placed. I was expecting this stage to take a long time, but when I compared my initial sketch with the photograph, I realised that it was surprisingly close and only a few minor adjustments were necessary. Once I was happy with the sketch, I transferred the outlines to a sheet of Bristol Paper and then it was just a matter of adding the shading. I found a way of helping with the problem of lack of tone by scanning the photo to my computer and adjusting the mid-tones. This made the shadows on the face a lot more apparent than they were on the actual photograph I was given and so much easier to work from. The portrait of Alfie really didn't take me long and it was actually nice to have something else to do between 'bear time'. I need to do more things like this I think! Q. What music did I listen to today? Hi Sandra, wow lucky alfies mommy! This is some sketch.... beautiful.. i wonder what it would look like in watercolor???? Fabulous, Sandra! He is adorable! an incredible drawing sandra!! it's coming along just beautifully! a perfect little guy face!! Sandra I just love him! You have done some truly outstanding work. All of his features are rendered with just the right amount of subtlety. He is so darling. I love his little nose, the soft curve of his cheek and his eyes! The detail just makes him sparkle. Well done!! :))) You should feel very proud, his family will love it. Aww, he's adorable! And I would say you are very accomplished at portraits! Great job! What a cutie-patootie! Well done, Sandra!!! Wow, Sandra! This portrait of Alfie is abolutely amazing! Bravissima! Hug! Sandra!! This is a beautiful, beautiful portrait of Alphie. His eyes are outstanding...perfect shadowing and LOVE his hat!!! Sandra, what a amazing portrait! 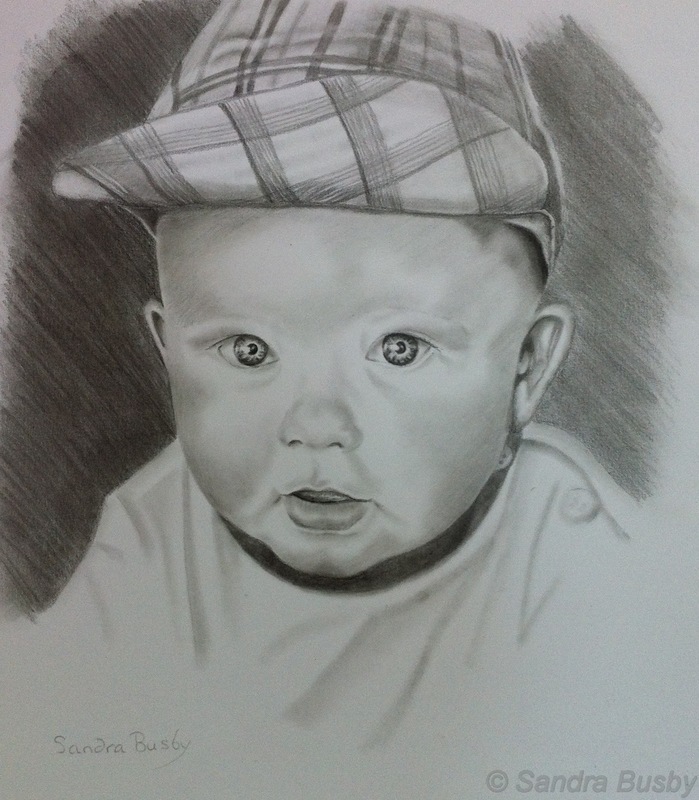 You are so talented in drawing, this baby is so tender! Bravissima!